(This is just copy pasted from BBC). 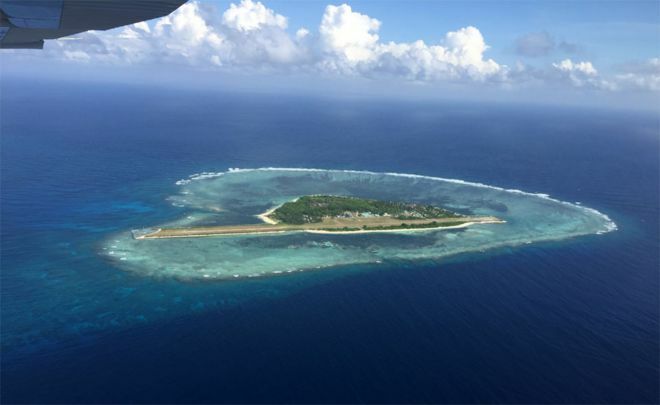 Last year the BBC's Rupert Wingfield-Hayes travelled across the South China Sea in a fishing boat and became the first journalist to observe close-up how China is constructing new islands on coral reefs. A few days ago he returned to the area in a small aircraft - provoking a furious and threatening response from the Chinese Navy. The scattered atolls, reefs and sand bars known as the Spratly Islands are a very difficult place to get to. Some are controlled by Vietnam, others by the Philippines, one by Taiwan, and then of course there are those controlled by China. Don't expect an invitation from Beijing. Believe me, I've tried. Only the Philippines will let you visit a tiny 400m-long scrap of land called Pagasa. It's just about big enough to land a small aircraft on. After months of planning and negotiation, I was sitting in a hotel room in Manila packed and ready to go when the phone rang. It was my colleague Chika. "Our permission to land on Pagasa has been revoked!" she announced. My heart sank. What had happened? Had the Philippine government been threatened? China's President Xi Jinping was about to arrive in town. Perhaps Manila didn't want a scene? In fact it was worse. Somehow Beijing had found out what we were up to. Next came a call from my editor in London. "The Chinese embassy has been on the phone. 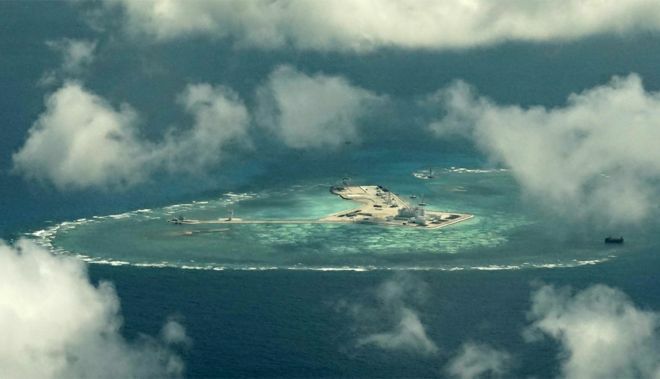 They're warning of problems if the BBC tries to visit what they say is territory illegally occupied by the Philippines in the South China Sea," he said. I mentally kicked myself. How had they found out? I should have been more careful. And so for a week I was forced to sit in my hotel room and watch while President Xi came and went. Then, more frantic negotiation… and finally the Philippine government relented. We could go. At 05:30 five of us gathered on the runway at Puerto Princesa, on the Philippine island of Palawan. Two pilots, an engineer, Jiro my cameraman and me. In front of us sat a tiny single engine Cessna 206. Jiro and I looked at each other. "Good God," I thought . "Are we really going to fly more than three hours across open ocean and land on a tiny island in that thing?" Even the pilots looked nervous. And with good reason - no-one had tried to do what we were about to do. With the tiny aircraft loaded down with camera equipment and fuel we swayed down the runway and lurched in to the air. Minutes later we cleared the verdant mountains of Palawan, and before us stretched the empty blue waters of the South China Sea. China is bound by the United Nations Convention on the Law of the Sea (UNCLOS), which it has ratified. The law states that sub-sea structures, such as reefs, cannot be claimed as sovereign coastline, and that building artificial structures on top of them does not turn them in to sovereign territory either. A country that owns a natural island can claim a 12-nautical-mile territorial limit around it, both on the sea and in the air. But artificial structures do not confer any such right. In other words, we would be able to fly our aircraft right up to China's new islands without breaking any international laws, and China should not interfere with our flight. We flew on south-west towards Fiery Cross Reef (Yongshu in Chinese). After another hour we could see it in the distance, a large expanse of yellow on the ocean surface. As we closed to 20 nautical miles the radio came alive again. "Foreign military aircraft to north-west of Yongshu Island, this is the Chinese Navy, you are threatening the security of our station!" This time the pilots' response was immediate, banking sharply to the north, away from the reef. "We need to get closer!" I pleaded with the captain. "We need to go back, we can't film anything from this far away!" "I am sorry," he said. "We have our orders." The previous warnings had shaken the pilots badly. My heart sank. "We are going to get nothing," I thought. Back on Pagasa, as the plane was refuelled again, I put my case to the pilots. "Look," I said. "We are not breaking any laws, the Chinese are not going to shoot us down. You must hold your course, and you must respond to them and tell them we are a civilian aircraft flying in international airspace." "You must understand, we are civilian pilots, not military," they replied. "We do not know what they might do to us, we have to put safety first." Finally, after hours of negotiation, they agreed they would give it a try. We took off for a third time, now heading back towards the Philippines. The tension in my stomach was almost unbearable. Would they hold their course? Soon, in the distance, a huge yellow crescent appeared below us, the unmistakable shape of Mischief Reef (Meiji in Chinese). The pilots descended to 5,000ft. At 12 nautical miles the warnings began again. "Foreign military aircraft in north-west of Meiji Reef, this is the Chinese Navy, you are threatening the security of our station!" Calmly our captain responded: "Chinese Navy, this is Philippine civilian aircraft en route to Palawan, carrying civilian passengers. We are not a military aircraft, we are a civilian single-engine aircraft." "Foreign military aircraft in north of Meiji Reef, this is the Chinese Navy!" On and on the warnings continued. But this time our pilots held their nerve. At 12 miles we skirted the north of the huge new island. Below us we could see the lagoon teeming with ships, large and small. On the new land, cement plants and the foundations of new buildings. Then, as we rounded a cloud, we got the first clear view of the new runway China is building here, just 140 nautical miles from the Philippine coast. I did a quick calculation. 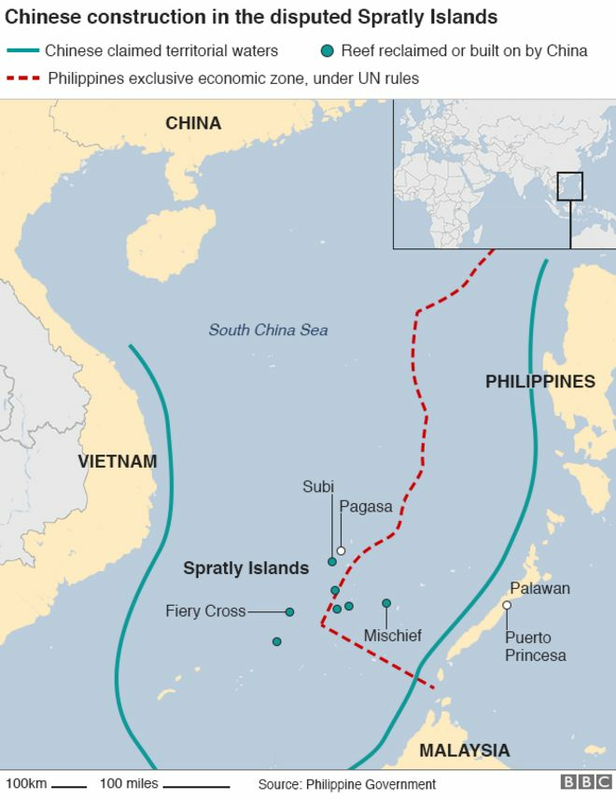 A Chinese fighter jet taking off from here could be over the Philippine coast in as little as eight or nine minutes. As we flew back towards the Philippines we all felt elated. We'd done it! I joked with the captain that we should turn around and take a low pass. The purpose of such flights is to demonstrate to China that countries like Australia and the US do not recognise its newly manufactured islands. But they do exist and China is already enforcing a 12-nautical-mile exclusion zone around them, or trying to. At Fiery Cross the warnings began at 20 miles. China has succeeded in creating new "facts on the ground". It is building new runways, high-powered radar stations and deep-water port facilities. In Manila last month US President Barack Obama said China must "halt all further construction" and "not move to militarise" these new outposts. From what I saw and heard, it is almost certainly already too late. Watch Rupert Wingfield-Hayes's television report from the Spratly Islands. Last year Rupert Wingfield-Hayes visited the Spratly Islands in a fishing boat. He filmed Chinese construction work on Johnson South Reef and called in on some Philippine marines permanently blockaded by the Chinese Navy on Ayungin Reef, where they live a lonely life in a rusting hulk - the Sierra Madre.